Untangle Your Mind – Relax Your Body is not a typical relaxation CD that relaxes the listener for a short time during the session itself. It is far more comprehensive with longer-lasting results. This structured three-step, mini relaxation course, teaches you to achieve and maintain a relaxed state, at will, at any time. It provides you with hands-on control over your own relaxation, whenever and wherever you need it. Following the 10 minute introduction you are guided through a 20 minute relaxation session. If stressed and/or unfamiliar with relaxation methods it is advisable to practice this session daily for at least 14 days. When the 20 minute session has been mastered and it is easy to achieve a relaxed state, you can move onto the 10 minute session. Either session can be undertaken as required. We recommend daily relaxation practise, so that it becomes a part of your life. The 2 minute session offers instant relaxation and can be used for emergencies or a reminder. It is particularly effective for events that you find exceptionally stressful. This should only be undertaken once the 10 and 20 minute sessions have been perfected. This in-depth system of instruction will generate a sense of wellbeing. You will find you are able to flourish under pressure, achieve better sleeping patterns and attain the energy levels you would like. The many benefits of relaxation have been well researched and scientifically proven. Relaxation is perhaps the single most important key to health & wellbeing and the best antidote to stress. Recent research has shown that relaxation practice is also incredibly helpful with pain control. Why is it so much more effective than other relaxation training? It condenses a unique combination of Antonia Boyle's experience acquired over 38 years of teaching yoga, relaxation and meditation to groups and individuals. 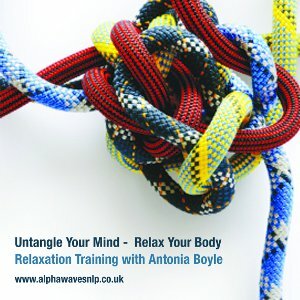 Her modern methods incorporate cutting-edge techniques developed to achieve and maintain a relaxed state at will, drawing on the powerful techniques of NLP: Read More> NLP is a practical, direct approach to human psychology and Antonia has used this to great effect in Untangle Your Mind – Relax Your Body.